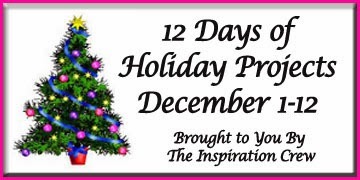 Welcome to Day 5 of the 12 Days of Holiday Inspiration Blog Event brought to you by "The Inspiration Crew". We’re just a group of online crafty friends who love being creative. This time we're doing a 12-day event to provide you with tons of Holiday Inspiration. Today I have a super quick and easy project for you. If you're like me you have tons of Washi Tape. I find I don't really use it that often so I love to find ways to actually put it to good use. I just took some plain white notepads that I got from Oriental Trading Company and wrapped Washi Tape around them. It was so easy and actually really fun to make these. For the first one I used some Washi tapes I've had in my stash for a while. For the second one I used a set of tapes made by My Minds Eye. I love sets because they all work together. For the third one I used Tim Holtz tapes that also come in a set. You could also easily add a cardstock sticker or anther embellishment on the front, but I didn't want to cover up all this Washi goodness so I left them plain. Thanks for stopping by and I hope you stop back tomorrow! What a great way to use Washi, love your mixes of pattern and colours! Donna these are fabulous! I really should make use of my tapes. I'm somewhat of a collector of washi tape. LOL!. Your little notebooks are so cute - I have both washi tape and notebooks in my stash but never thought of using them together. Thanks for the tip. This is SO fun! What a brilliant idea to use the Washi tape, Donna! I am with you on use your own stash! Hope the construction of your new house is going smoothly! 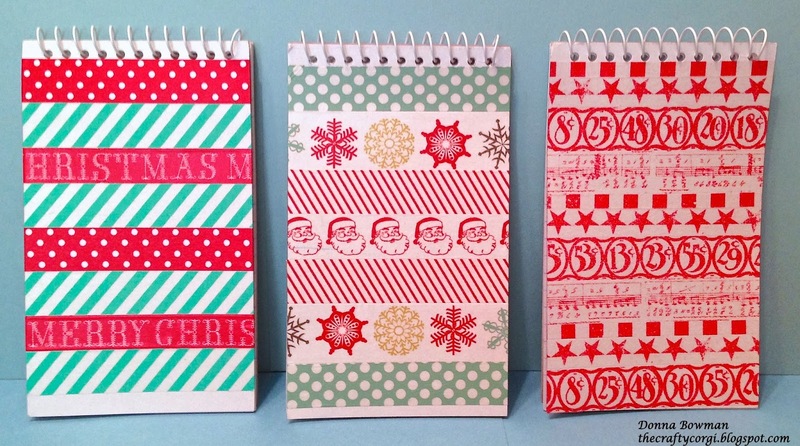 You are so clever to use up some of your washi tape and inexpensive notebooks to make fun and useful gifts. Love it! I really love this idea. So perfect for gift giving too! wow you have got the best selection of washi tape.. these are adorable..
Oh my, these are so cute and, like you, I have a ton of washi tape that I never use! Love these cute little stocking stuffers! Wonderful way to jazz up notebooks to make them ever-so-pretty! Fabulous inspiration! ...this is like hitting the Powerball Washi Tape Lottery! A totally clever and ingenious way to use up my rather 'limited' collection of tape (like 900 rolls of the stuff!). Thanks for this awesome idea!!! Great idea for a fun way to use washi tape! Cute little stocking stuffer idea! Very festive and great way to use up my stash of washi tape.